For a long time multi-tasking was a buzz word in the corporate setting and a desired trait in many job interviews. It’s too late for me to hunt down the research but I have come across a few different articles in the last year or two debunking the myths that we are actually good at multi-tasking or that we are more productive when we attempt to be. As much as I like having a variety of projects to work on, I do find that my productivity tends to suffers when I jump quickly from task-to-task during the day. 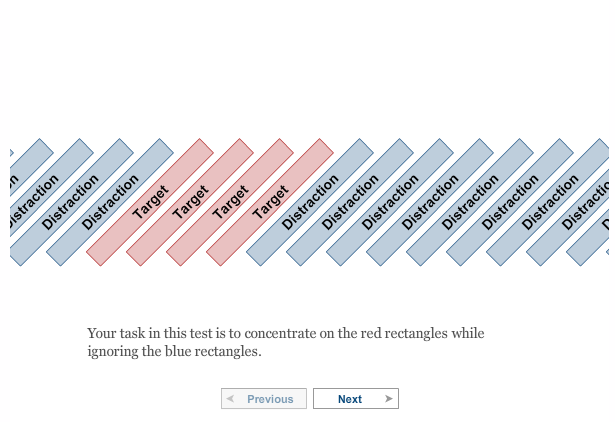 I just spent the last 5 minutes testing my personal theories on some simple NYTimes interactive tests. As I imagined, I scored quite well on the Focus portion and fell short of average on the Juggling Tasks (multi-tasking) test. Care to see how you perform?